I love the light airy look of Karalee Petite Pink, I have often planted this in hanging baskets mixed with petunias and verbena. 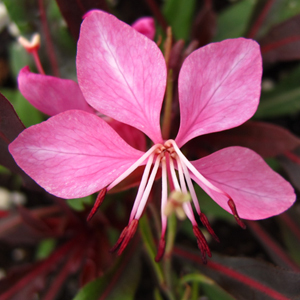 Karalee Petite Pink stands tall above other plants in a combination planter or basket. (Butterfly Flower) Karalee® Petite Pink Guara has airy wands of pink flowers that hover like butterflies over dark green to burgundy foliage. Karalee® Petite Pink blooms all summer long.